With two new calibres, original metal bracelets and an unusual skeleton tourbillon in a 42 mm case, the Excalibur 42 collection opens a new chapter in its history. Unveiled at SIHH 2013, this collection offers three new models: Excalibur 42 Skeleton Tourbillon, Excalibur 42 Chronograph & Excalibur 42 Automatic. 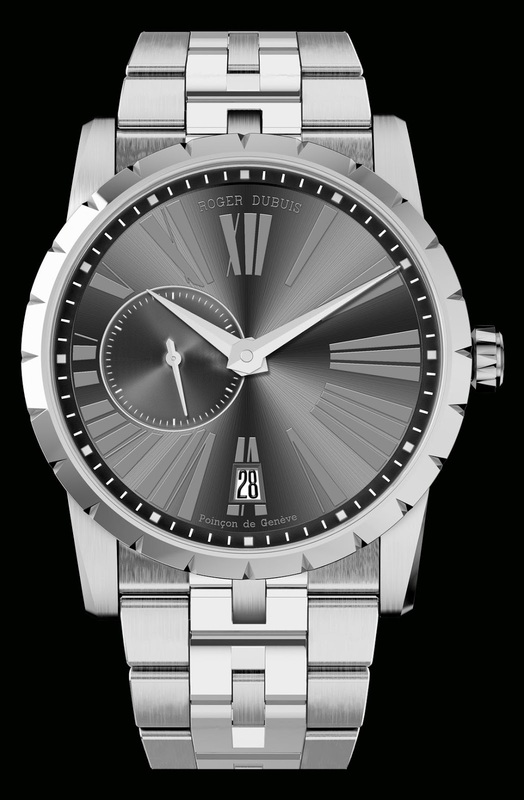 The Excalibur 42 collection pays homage to power and design. Roger Dubuis infuses the collection with undeniable daring style and technical prowess by equipping it with two original movements – RD640 and RD681 – as well as new metal bracelets and, for the first time in a 42 mm case, a skeleton tourbillon calibre, the RD505SQ. Its technical features set it apart and its design fully meets its expectations. The three new models present the iconic codes of the Excalibur line: the triple horns that attach the bracelet, the immediately recognisable fluted bezel, and the elongated Roman numerals. In the automatic versions, the small seconds counter is perfectly positioned at 9 o’clock, the chronograph alternates black and ivory dials – or even blue or chocolate dials in the boutique special series – while the minimalist purity of the skeleton tourbillon shows once more that the skeleton movement is truly embedded in the brand’s DNA. It comprises 165 components and displays a 60-hour power reserve. The other two latest-generation calibres incorporate the hour and minute functions, a small seconds at 9 o’clock, the date and micro rotor (RD640) at 6 o’clock, a semi-instant 30-minute counter and a tungsten micro rotor at 3 o’clock (RD681). Because of the firm conviction at Roger Dubuis that the quality of a work of art can be seen in its smallest details, their finishes are superbly refined. Decorated with “Côtes de Genève”, they comprise 198 and 280 parts respectively; they run at a frequency of 28,800 vibrations/hour (4 Hz) and have a power reserve of 52 hours. All three movements have been designed, developed perfected, assembled and regulated in-house. And, as the final step in this ultra-demanding approach, the watches they drive are stamped with the prestigious Geneva Seal. 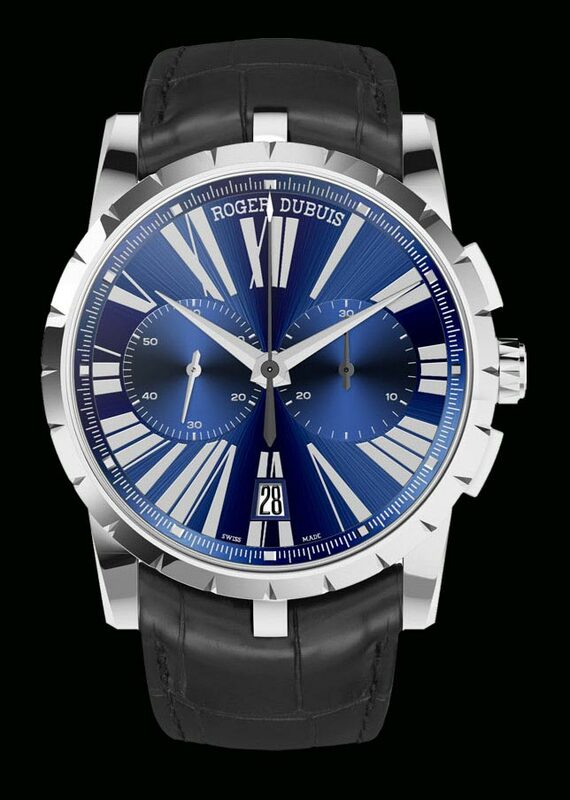 It is the world of the Warrior with his masterly skills that has inspired Roger Dubuis to develop these three versions of the Excalibur 42 imbued with strength, rugged character and technical expertise. A deliberately extravagant demonstration of style and watchmaking expertise, the Excalibur 42 Skeleton Tourbillon incorporates two unmistakeable features of Roger Dubuis creations: the flying tourbillon and the skeleton. In fact, the Geneva watchmaker is alone in offering this combination and it has become a real speciality of the brand. The Excalibur 42 houses a skeleton tourbillon of exceptional quality and unusual design that incorporates the identifying codes of the Excalibur collection: sharp angles and a strong visual impact linked to a perfect mechanism. The ergonomic 42 mm case offers an alternative to the Excalibur 45 Double Skeleton Tourbillon. Its plates and bridges are reduced to the absolute essentials and the RD505SQ calibre offers a light, spacious display of advanced mechanics in action. With 165 components, it is a perfect combination of technical performance and visual magic and, fitted in a pink or white gold case; it demonstrates how Roger Dubuis has given the art of skeletonising an unmistakeably contemporary architecture. The exceptional mechanism, beautifully finished, offers a modern interpretation of Fine Watchmaking. The two Excalibur 42 Skeleton Tourbillon models in pink or white gold are both stamped with the prestigious Geneva Seal. The dynamism of its design and the superb mechanism it reveals combine to give the Excalibur 42 Chronograph that special character and touch of extravagance that set it apart from others in the world of Fine Watchmaking. Its strength also lies in its exceptional movement: all six models of the Excalibur 42 Chronograph are powered by the new automatic chronograph calibre RD681 with micro-rotor. It displays the hours, minutes and small seconds in a dial at 9 o’clock and the date in a window at 6 o’clock. 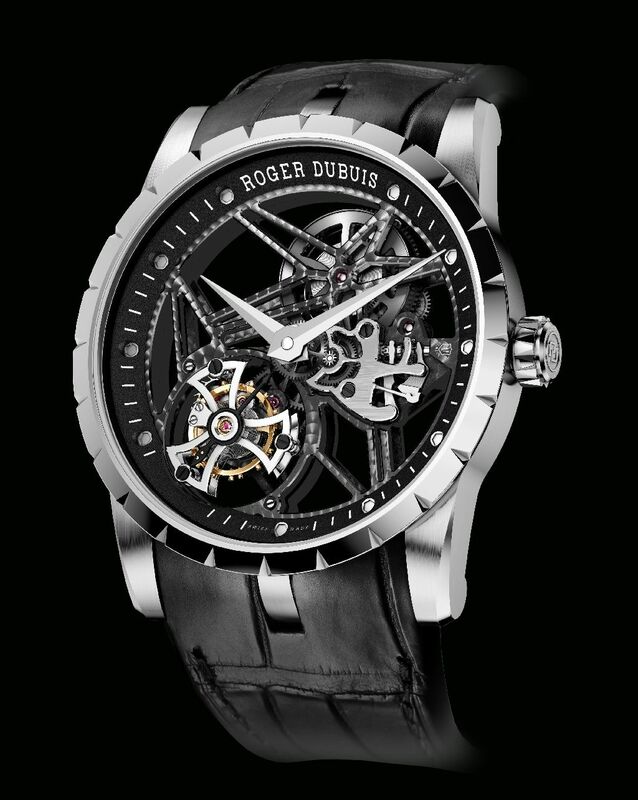 Designed, developed and produced in the Roger Dubuis Manufacture, it contains 280 components. Both its aesthetics and performance meet the demanding standards of Fine Watchmaking and, in addition, it carries the prestigious Geneva Seal (certification in progress). The automatic versions communicate their authority immediately with transferred Roman numerals standing out on the central dial. They are both appealing and highly readable: the hour and minutes are indicated on the main dial, the date appears in a window at 6 o’clock and the seconds in a small counter at 9 o’clock. The watches are powered by the automatic mechanical movement RD640 comprising 198 components. The shaped case in steel or pink gold is enhanced by rhodium-coated pink gold appliques and its elegance extends perfectly into the new steel or pink gold bracelet. In the tradition of uncompromising excellence that has built the reputation of the Geneva watchmaker, these models are all stamped with the prestigious Geneva Seal. Just as the skills of swordsmanship were constantly practised, the smallest details have been analysed and refined to fully convey the richness and balance that characterise this watch. 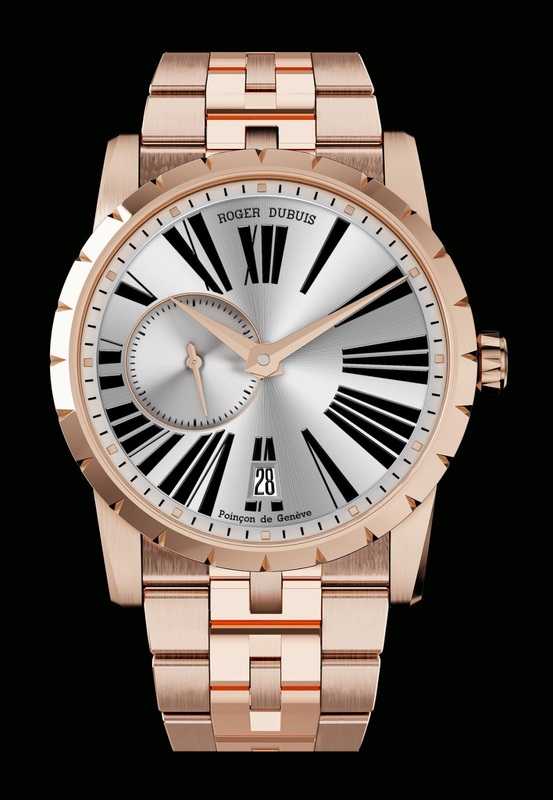 With its new bracelets in steel and pink gold, the Excalibur 36 infuses contemporary style with a lively new spirit. An experienced eye soon sees that the Excalibur 36 uses simple lines to express its true brand’s DNA. They reveal dials that are satin-brushed in a sunburst pattern and finished with a semi-matt varnish or a rhodiumcoating. The dial, with strong graphics in black, white or blue, seems to have blossomed to open up to the world. The 36 mm case of the Excalibur 36 in pink gold or steel emphasises its shape and curves with alternate polished and fine-brushed finishes. Its transparent sapphire case-back reveals the careful “nishing and “Côtes de Genève” decoration of the Roger Dubuis mechanical calibre RD821. It comprises 172 components, runs at a frequency of 28,800 vibrations/hour (4 Hz) and has a 48-hour power reserve. To complete its ultra-demanding approach, Roger Dubuis submits its movements and watches to a leading independent control authority: the Geneva Seal. It remains the only Manufacture whose entire production is stamped with this prestigious Seal.